After leaving the bus and train station take the walking route through Kennedy park/ Eyre Square. Walk through the pedestrianised streets of Shop Street, High Street and Quay Street. At the end of Quay street (Jury’s Inn hotel on you right) walk over Wolfe Tone bridge. After the bridge you will pass through a set of traffic lights by a park with a children’s play ground on your right from which you will see Adare Guest House to the left of the Park. From all three locations you will end the motorway at the Martin roundabout. Take the city centre exit from this round about which will be the first on your right hand side. You will go through a set of traffic lights, straight through one more round about and another set of lights until you reach the Huntsman bar and restaurant. The huntsman’s bar will be on you left hand side take a left at these lights. Continue for 200 meters approximately then take a left. Keep going on Lough Atalia Rd. with the sea on your left all round Galway docks until you reach a bridge with Jury’s Inn on you right. After the bridge you will pass through a set of traffic lights by a park with a children’s play ground on your right from which you will see Adare Guest House to the left of the Park. Take the first right after the next set of traffic lights this will bring to Fr. Griffin Place. Take first left from the Airport. Continue through first traffic light up to the first roundabout. At this round about take the 3rd exit. Take first exit and then 100 metres take a sharp right. Continue through the next set of light until you reach lights at Huntsman Bar and restaurant. Go through these light for approx. 200 metres and take a left. 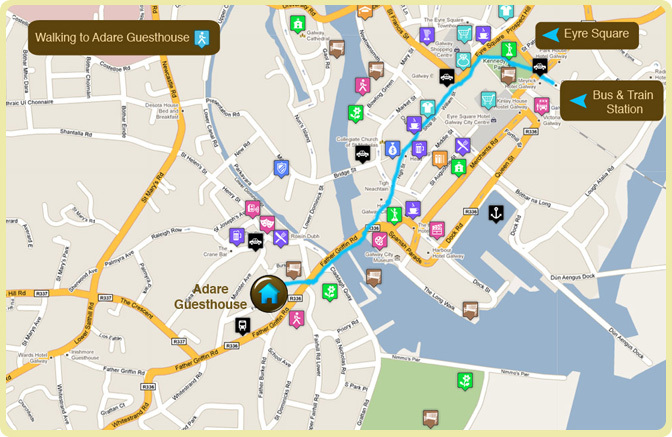 Keep going with sea on your left all round Galway docks until you reach Bridge with Jury’s Inn on your right. After the bridge you will shortly pass a public park with a children’s playground from which you will see Adare Guest House on the left of the park. Take the first right after the park to reach Adare Guest house. After passing through Spidall you will drive through Barna village. Keep driving until you reach a set of traffic lights. Go through the lights and drive straight until you reach another set of traffic lights. Go through these traffic lights and at the next set of lights take a left. Immediately on you left hand side you will see a Supervalu market, pass this out and take the second left. Continue to the very end of this road and you will have reached Adare Guest House. After leaving Moycullen village keep driving towards Galway city until you reach traffic lights at your rights hand side you will see always Galway regional Hospital. Continue straight through the next two sets of traffic lights and at the 3rd set take a left. At the next set of lights take another left. Immediately on your right hand side you will see a Supervalu market, pass this out and take the second left.